It’s important, but not nearly as important as getting into majors or winning them. “Given where we are now with the significance of the FedExCup and now the Wyndham Rewards Top 10 and a shorter season with fewer at-bats in the playoffs, the significance of these fall events has grown. The support they get from the markets they play in and the sponsors has grown and they are as critical a part of the season as any,” Monahan said. Golf is still about the majors and for viewers, sponsors and players, January-July. So while the Wyndham Rewards could be the real reason Jordan Spieth is playing in Mexico this week, they likely are not given that he heard from his buddies what a great event the Mayakoba Classic is (as the story notes). There is one disconcerting takeaway from Hoggard’s story: increased fall starts may be a response to the crowded 2019 schedule and the expected need to drop starts to deal with a compacted schedule. Monahan concedes that the flow of the new schedule will likely create an extended learning curve for players who must now find places to take breaks in order to play their best when it matters the most at the majors. One of the likely ways players will do that is to add to their fall schedules. So stars may subtract a stop or two during the bread and butter portion of the season when the most eyeballs are on the sport. Something to remember when the old Bob Hope Classic can’t get a sponsor or events like Bay Hill struggle to draw a star-studded field. To put it another way, selling FedExCup sounds more important to the PGA Tour than the individual tournaments doing the heavy lifting and charitable contributions. Some events will benefit from the schedule change and shifting dynamics, but by touting the potential trimming of field quality in the prime winter/spring season to prop up the fall, the tour risks chipping away at the “product” presented when the most eyeballs are watching: the West Coast and Florida Swings. Monahan On The Players: "This product works in May, this product works in March." He hasn't rolled out a Finchem-esque coterminous or compaction reference, but Jay Monahan has definitely picked up a case of B-speak during a week of Players Championship meetings. From a chat with GolfChannel.com's Rex Hoggard, updating us on the schedule, the Tiger-Phil pairing and the state of the Players. “To bring the best field in golf here, early in the season and to be able to use this platform and have tent-pole events, big events, every month March through July and get the playoffs to a position where we’re really excited about where we’re going, that’s good for the overall schedule. "PGA Tour commissioner Jay Monahan proves to be what tour needed"
Steve DiMeglio of USA Today profiles Commissioner Jay Monahan a year into the job and notes the strong run of late securing sponsors, including nine tournaments with 10-year deals. He is pleased and humbled by the opportunity. “Tim paid Jay a very high compliment one time when he said to me, ‘You know, I don’t really want to retire, but Jay is so ready. I need to get out of his way,’” said Davis Love III, one of four players on the Tour’s policy board. “That’s the highest of compliments. And I think we'll all remember this next time a PGA Tour player leaves a ball down as a backstop in defiance of honor and integrity. The European Tour introduces a shot clock tournament this year in response to a growing sense the pro game takes too long. And while we have not seen the slow play "personal war" predicted by Chief Executive Keith Pelley when he took the job in 2015, the European Tour continues to suggest that it sees where the world is headed: toward shorter, tighter windows for sporting events. Major League Baseball is working desperately to shorten games. Bold proposals will be floated at the upcoming owners meetings, even to the point of experimenting with radical plans for extra innings. This comes after the first wave of pace initiatives did not go far enough. The NBA has already limited timeouts at the end of games and cut TV timeouts. The end of a game moves better. The NFL attempted to address fan concerns about their long games but only made a half-hearted attempt at picking up the pace. At least they tried. Even professional tennis is experimenting with a much faster product for the "NextGen". 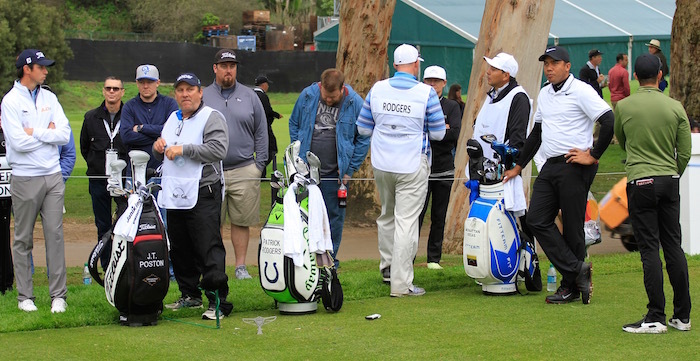 The PGA Tour avoids enforcing its pace of play rules and, as we saw at Sunday's 6-hour Farmers Insurance Open that was tainted by J.B. Holmes, this is a tour rallying around a player who openly defied (paying) fans, his playing partners and common sense. He knew he could not be penalized so why rush? We could blame the PGA Tour's slow-play apathy to now-retired Commissioner Tim Finchem's disdain for penalty strokes and his obsession with vanity optics (such as players taking off their caps to shake hands). Those concerns of the Commissioner's office about a player's brand taking hit made enforcement impossible for the tour's referees, who also face pressures in moving fields around from faster greens and distance-driven log-jams on half-par holes. There was hope new Commissioner Jay Monahan would follow the progressive lead of colleagues like Adam Silver (NBA) or Rob Manfred (MLB) and realize that younger fans are far more interested in action sports that take less of their time. But forget the kids. Who can watch a sport that takes over five hours and featuring players who have no regard for anyone else but themselves? Imagine paying $55 to watch a guy not play ready golf and playing only when he absolutely feels ready. By signaling this week he sympathized with the supposed plight of Holmes, Monahan confirmed he will not use the power of the Commissionership to speed up play. All Monahan had to do was suggest that with high winds and pressure, it was a tough spot but the fans were right to believe this was a less-than-ideal look for the sport, particularly at a time millions of non-golf fans had tuned in for the Grammy's. Instead, Monahan made it hard to believe his tour is interested in gaining new fans or in addressing the concerns of longtime fans that some of today's players are just too slow to watch. The Holmes incident captured on camera what paying fans all-too-often see during a PGA Tour event: a player taking much longer than their allotted 40 seconds. Meanwhile, the European Tour is forging ahead with pace-related initiatives on multiple fronts designed to draw in new fans and intrigue those bored with the sport. While some of the measures are extreme and a middle ground with the PGA Tour position is the ideal, at least the European Tour is building off of the prevailing view after golf's 2016 return to the Olympic Games: the professional sport is woefully ill-equipped to compete in the global sports marketplace at its current pace, scale and preferred format. The pro game will fade into irrelevance if it does not adapt in a world that loves sport more than ever, just in smaller doses. It's hardly a shocker that someone who speeds up a shot in hopes of taking advantage of a backstopping ball on the green has no problem with J.B. Holmes pitching a tent, even when at the expense of his playing partner and the PGA Tour product. But that's Justin Thomas' view of last Sunday's debacle. “I have J.B.’s back all day on that situation,” Thomas said Wednesday at the Waste Management Phoenix Open. “It bothered me and I hate it for him. I went up to him (Tuesday) and told him … it was a great tournament for him, but I have a hard time saying I wouldn’t do anything differently than he did. Again, nothing bad times and a penalty stroke now and then wouldn't fix. Or a "spirit of the rules" class. Sadly, Commissioner Jay Monahan missed an opportunity to address speed of play, essentially confirming he will continue the do-nothing approach of his predecessor Tim Finchem. There you go boys, take all the time you need until you get the wind you like. With the inaugural CJ Cup at Nine Bridges over and another nine playings on the docket, Commissioner Jay Monahan and tour EVP of Global Business Affairs Ty Votaw traveled to Korea. They kindly sat down with the assembled media before Sunday's final round and took some interesting questions. Q: It’s great that we have got another event in Asia. From the next season, 2018-2019 season, you are going to make some big changes with possibly the playoffs coming soon and the PGA Championship moving. It looks to me as though you are going to free up more dates in the fall, in the post-labor day area. Are you planning more tournaments in Asia? Japan or China? Jay Monahan: I would answer that by confirming that we have what you just mentioned, which is we have the commitment to move the Players to March and PGA Championship to May. You were right in that it does freeze some time in the fall. The next step we are going to take in order affect change is to essentially complete other parts of our schedule the tournaments that exist in that pre-labor day window in the U.S. But we are a global game. If you follow the logic trail of being here, you look at the fact that you’ve got 3.5 million participants and 36 million rounds of golf played, we love what we are seeing in terms of emergency screening technology, the fact that we’ve got such a rich number of players. As you look out into the future, the reason that we are putting so much resource into key international markets is so that we are prepared when an opportunity presents itself to expand to be in the right position. But to say something is imminent would be a miscalculation and a mistake at this point. We'll put them down for no further Asian expansion at this time. Q: Are you surprised to see only a few foreign press covering the event, given that this event is quite significant? Why do you think that there aren’t many global press covering this event here? Ty Votaw: There is no question that we are very excited about the opportunity to be here, first time being an official event. The media landscape in all countries is changing and as you know, the golf media in the US is also changing with decreased budgets and decreased stabilities to cover even some domestic events in the US. We now have opportunities with other platforms and other areas. I know that our own platforms are here covering extensively for the US and for other countries around the world. I will say that, much like the reactions of our players, when they go home and talk to other players about their experience here, I think you will see over the next 10 years when we are coming to South Korea and to Jeju for this event that a broader swath of media coverage will follow. Q: The Korean fans are grateful that Sang-moon Bae and Seung-yul Noh were given exemptions, given their situation with the national service, and that PGA has shown a lot of respect for the Korean golf. However, given that is a Tier 1 tournament with a decent sum of prize money, don’t you think that we are missing a lot of the top-class players? For example, Hideki Matsuyama and Ernie Els pulling out and not many players from the top 20? Ty Votaw:As I mentioned earlier, I think that the experiences of the players who are here this week, when they take those stories and those experiences back with them to the PGA tour it’s going to be very positive story that they are going to be telling. As any PGA tour event on our schedule, our players choose their schedules according to what fits their specific need and their specific goals and desires. Certainly, we have added a third event in Asia this year and there has been a significant support of all three events by the top players but, perhaps not all three events by the top players. I think what you are going to see is, the ability for players to evaluate what their experience was this week and last week in CIMB and in HSBC, and they will set their schedules accordingly. I think we are very pleased with the feel that we have this week, as commissioner mentioned earlier, our ability to have our Fedex Cup champion, our rookie of the year, former number ones Jason Day and Adam Scott plus all the other great players who are on the field this week. It’s a great start to a long term commitment by CJ and I think we will continue to do everything we can to make sure that our players support these important sponsorships. All fair points, but it's hard to read this and wonder about the impact on up to four sponsor-less U.S. stops and many other domestic events get poor fields because players may now skip those for $9.2 million purses in Asia. Q: I think there are a few things that can be improved in the future. The tournament is over at 3pm and it seems to feel a bit loose and it’s difficult for the gallery. Would it be possible to increase the field? Monahan: This is just the first of our ten-plus years here. One of the things we knew going into this week was that we're going to do our very best to execute a world-class THE CJ CUP @ NINE BRIDGES, but when we left at Sunday night there’ll be a number of things we could learn from over the course of the week, and our constant pursuit to improve and get better and do the best we can in South Korea. That’s exactly what will happen. We’ll look at every facet of the tournament. We'll make significant improvements in any facet of this event. We're not done yet. This tournament will be finalized in the next several hours but I would say that at this point on Sunday, what has happened on the grounds here, the response that we received, the things we learned from the fans here, we’re really pleased with where we are. First on tap, ordering extra satellite time! Team USA's victorious 2017 Presidents Cup team received the gold trophy from President Donald Trump who kept his remarks brief. Golfweek's David Dusek on the presidential arrival and visit. Things got off to a rocky start when the President hit send on a Tweet that criticized his predecessors. PRESIDENT DONALD TRUMP: They are very talented, and they really are people that have good hearts. I want to congratulate the Internationals. On behalf of all of the people of Texas, of all of the people of -- if you look today, if you see what's happening, how horrible it is but we have it under really great control, Puerto Rico, and the people of Florida, who are really suffering over this last short period of time with hurricanes. I want to just remember them and we are going to dedicate this trophy to all of those people that went through so much. And I tell you what, I've been watching this from the beginning, and I have to say our Team USA, wow, did you play well. That great putter that I've been copying his putting stroke for many, many years, but it hasn't worked; Steve Stricker. We're going to present Steve with the trophy. I want to thank everybody. This is a special group of folks, tremendous money is donated to charity by the TOUR every year. Stricker said it was a great honor to be the first captain to receive the cup from a sitting President of the United States, Will Gray reports. The circumstances led to some fascinating scenes, including this sight of Commissioner Jay Monahan having been commissioned by Dustin Johnson and Paulina Gretzky for a photo with Donald Trump. Bob Harig kicks off Players week with an extensive ESPN.com profile of new Commissioner Jay Monahan. Much of what Monahan says mirrors comments he made on ShackHouse (message discipline students take notice! ), but one area we did not cover on the show stood out in Harig's piece. Monahan, to date, has brushed aside most pace of play talk. But this sounds like he's taking a harder look at the matter. "As it relates to slow play, a lot has happened behind the scenes in the last 12 to 18 months. We've developed a Shotlink dashboard for our rules officials where you can at any point in time see where a player is relative to time-par, see where a player is relative to their own historical averages. And we disclose all that information to the players, and so the players are well aware. (Players are only given information about themselves, not other players.) They have access now. 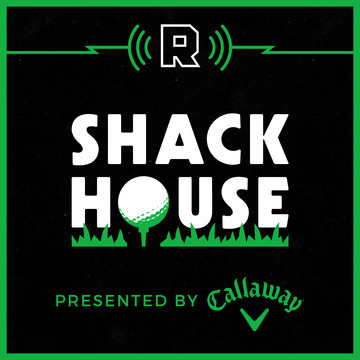 New PGA Tour Commissioner Jay Monahan enters the ShackHouse to chat about his new gig, the latest USGA/R&A announcement, future format possibilities, Golf Fights Cancer, his bucket list courses and more. For a good pre-show primer, earlier this month SBJ's John Lombardo filed this piece on the business matters Monahan is confronting. Prior to the Commish, House and I kick around the exciting new Zurich Classic format, our favorite teams and set up the Monahan interview with a chat about the current issues facing all sports commissioners. As always, you can subscribe on iTunes and or just refresh your device subscription page. Same deal with Soundcloud for the show, and Episode 34 is here to listen to right now! As always, ShackHouse is brought to you by Callaway, makers of the Epic Driver that is now part of Callaway's very groovy Customs program along with Mac Daddy's and Chrome Softs. Check it out. New PGA Tour Commissioner Jay Monahan spoke to Guy Yocom for another excellent Golf Digest My Shot and while I always urge you to read the full interview, a couple of comments stood out. WHAT DO I ADMIRE MOST ABOUT OTHER MAJOR-LEAGUE SPORTS? Two things. One, the way the NFL, MLB, the NBA and the NHL conclude their seasons. I love where we are with the FedEx Cup, but keep in mind it's only 10 years along, is still evolving, and we're always on the lookout for ways to sharpen our postseason-playoff structure. Oh yes, the playoffs are definitely ending before Labor Day. But those sports also conclude their seasons with much more compelling playoff formats, so let's hope this is more than just a calendar adjustment. Two, I admire the way they build and market their brands through their own networks. Having a 24/7 presence has served those sports very, very well. Someone wants his own network! While those networks were all essentially offspring to the Golf Channel and have been successful to some degree, has the 24/7 presence of the MLB Network really sold that many more seats or created new fans? And is that a risk worth taking, or just a negotiating ploy for 2021 when the current Golf Channel deal ends? WHICH TAKES US TO THE SUBJECT OF SLOW PLAY. I don't see a problem with rounds on our tour taking four hours, 45 minutes, because it's been consistent around that number for a long time. What drives the small amount of criticism is the impulse in the modern world to do everything faster than we did it last year. So am I going to push for faster rounds? As it stands, no. After getting to see some solid PGA Tour action and some not-so-solid pace of play, I have read with interest Karen Crouse's New York Times story from Riviera on the topic. Leadership in golf has generally--with exceptions--signalled a desire not to act. Going forward I believe we need to separate the issue a few ways so as to not allow the issue to be clouded by excuses. 1.Length of round for the everyday game. WSJ's Jason Gay included golf in this humorous roundup of what sports are doing to speed things up for an increasingly distracted younger generation. It isn’t just the big leagues that are worried. It’s every sport. And it isn’t only the sports we watch on TV—it’s the sports we all play, too. Every game needs to be fast. Golf, in particular, is in a high panic that asking anyone under 80 years old to play 18 holes is like asking them to take a month-long canoe trip down the Amazon. Are you kidding me? Eighteen holes of golf? What do you think I am, dead? Speed is the rage, we’re all constantly told. People want experiences that are quick and effective and capable of being packed into a torrent of life events. My Journal columns, for example, are now mostly read on mobile phones by readers who are parachuting out of airplanes while using Instagram, fighting robot dinosaurs and making lunches for their kids. 2. Consistently slow golfers who disregard the 45 second rule and fail to play ready golf. There are some--like Ben Crane--who has spent over a decade taking too long to play even a basic shot. Because they're "nice guys" or they make light of their pace in lame videos, they get a pass. When their play is so disproportionately slow compared to their peers, the behavior is unbecoming of a professional golfer. From an in-person spectator view, such play will make people stay at home instead of coming to pro golf tournaments. And its rude to a player's peers. John Feinstein and I tackled this question on Golf Central today. While I agree with those who say penalty shots are the only solution, I'm increasingly of the view that the only way to make people speed up is to shame in the form of huge (published) fines, reporting each week's bad times and/or having a bonus pool that rewards faster golfers based on ShotLink data. 3. Golfers taking their sweet time in a high-pressure situation. This is the issue Crouse considers in her piece, with Jason Day as the centerpiece. While he is perpetually slow, I think we all understand his view that he should not rush a key shot down the stretch. He even cites the support of Tiger Woods. However, Day's argument falls flat because he is slow all of the time. Tiger plays at a normal clip, buying some political capital when he has set up shop over a key shot. Same deal with Phil Mickelson. And from what I saw of Jordan Spieth last week when paired with rabbits Bubba Watson and Bill Haas, he's moved into the same category as Tiger and Phil. It's also not apparent what the bonus is of watching any round of golf take 25 minutes longer than is necessary. He noted that events not affected by weather delays or extra holes were being completed within the telecast window, which, like airline flight schedules, is padded to allow for lag time. Which speaks to the last point: such slow play is interesting when it's a leader down the stretch. But on Thursday to Saturday, the sport is turning people off who come to golf tournaments and watch people stand around. New PGA Tour Commissioner Jay Monahan sat down with Golf Channel's Rich Lerner at Kapalua, with part one of their chat airing on Monday's Golf Central (part two is set for Tuesday's Morning Drive). He touches on slow play at the 7 minute mark and the answer isn't encouraging given that he cites the tour's ability to sign off on time for television as a sign that things are okay. But of more immediate note were remarks on trying to return to the Miami market, but probably not to the president-elect's Trump Doral. Monahan said the Tour continues to seek a new sponsor for the Miami stop, which has been a Tour stable since 1962, and that it’s “highly likely” that the circuit would return to South Florida. But at Trump Doral? Monahan was not that specific. Best golfer to ever sit in the White House? They say the president from Massachusetts was pretty good. He seemed to lower expectations for a potential PGA Tour schedule ending by Labor Day, but did confirm that if the PGA of America moves its championship to May and all other dominos fall, that the playoffs will be shortened by one tournament. Monahan said no decisions on possible changes have been made and that the other players in the mix, most notably the PGA of America which would give up its spot as the year’s last major, would need to see the value of a possible makeover. Another piece of those changes would likely be a reduction of the number of FedEx Cup Playoff events, from four to three, and Monahan confirmed postseason contraction is a consideration. “If we were to execute the schedule that I just mentioned I think it’s likely,” he said. Based on sponsorship contracts, that would likely mean the end of the Boston stop, leaving New York and Chicago/Midwest as the two "playoff" events. New Commish Likes Tiger's Energy And "Countenances"
Look, he just spent the last two years as Tim Finchem's fixer. PGA Tour Clarifies: We Really, Really Love You May!